Nothing keeps us more inspired than traveling to foreign places. These places challenge our perspective and spark creativity. You can always discover a piece of our adventures within our inventory whether it’s a Mexican woven chair here or a touch of Morroco there. One of our favorite spots was Barrio Italia in Santiago, Chile. This little quarter is one of the city’s secret gems. Everywhere you look, there’s something design worthy. The street spans blocks of just furniture– decorative light fixtures to modern to vintage pieces line the streets. Furniture combining Chilean and Creole influences. Hidden pathways lead to galleries filled with even more stores and restaurants, like the one we found below. We stumbled on Cafe Rendebu while looking for a spot to grab a quick coffee. Once we saw the red Navy and Marais chairs, we knew we were in the right place. For us, it’s all about balance and toeing that line between opposites — in this case, rustic/DIY meets modern fun. 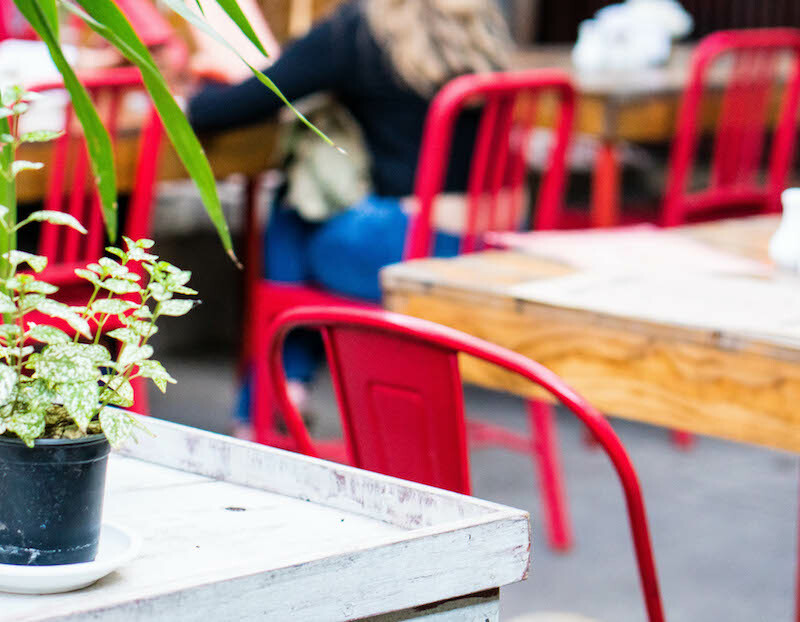 If you find yourself in Santiago, we recommend that you try out some of our favorite restaurants like Cafe Survenir, a perfect tucked away lunch spot, offering up delicious sandwiches and coffees. Another cafe favorite was Cafe de La Candelaria for brunch. Barrio Italia in Santiago, Chile has no shortage of secret, hidden spots if you don’t mind taking the time to explore!